"Shout for joy to the Lord, all the earth. Worship the Lord with gladness; come before him with joyful songs. Know that the Lord is God. It is he who made us, and we are his; we are his people, the sheep of his pasture. Enter his gates with thanksgiving and his courts with praise; give thanks to him and praise his name. For the Lord is good and his love endures forever; his faithfulness continues through all generations" (Ps. 100). Are you a worshiper? 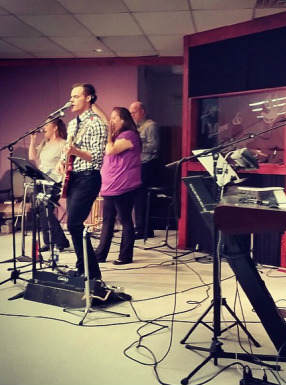 Your talents and gifts can be developed in worship ministries. We are looking for singers, musicians, those willing to learn media projection, and sound reinforcement who love Christ, love to serve and are called to ministry. We will train. Entry opportunities start on Wednesdays. Contact Pastor Lee for information plee@rezlife.org. At Rez Life, we love to worship! We worship the Lord because He is worthy, and when we do, our minds are renewed and our hearts become receptive to the prophetic ministry of the Spirit and the preaching of God's Word. If you have an interest in joining our team in any capacity (band, vocals or sound/media), we'd love to get to know you! You can email Pastor Lee at plee@rezlife.org or submit and application using the form below.